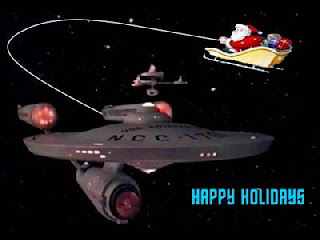 Yeah, I know it's a little geeky, but it always seemed like a nice way to tie in the boat's theme to the holidays. 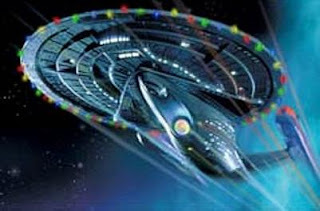 Yet, yesterday we received an email from our very own Lt. Jonathan which showed me, thankfully, that on the Geeky Scale, I had a long, long way to go. Light Years. We're talking 100 years at Warp 10. 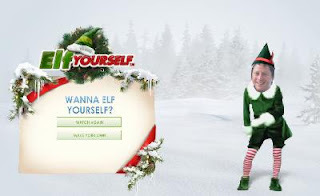 Apparently Jonathan found a website called ElfYourself, a service provided by OfficeMax (which now will keep me shopping at Staples forevermore) where he could place his photo on top of a dancing Flash-animated elf. And, because the holidays are all about family, why not get the wife laughed out of PTA meetings and the kids beat up at school too?? But, the photos just don't do this justice. So please, fans of the log worldwide, click on this link and turn up your speakers. I watched completely shocked and speechless. Will he show his face on the boat again? Can I even let him on the boat again? Dave, Mitch and Kenny will have months (MONTHS!) to come up with comments about this. 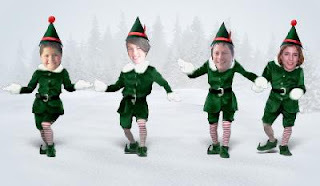 In May, will everyone's mind be focused on sail trim or on Jonathan in an elf costume complete with red and white-striped tights? So much for being competitive in 2008. I began to wonder what kind of prodding and promises a family would have to make to convince a grown man to to do this and send it out to his friends. Would Dave ever do something like this with his family? I mean, you could promise me new sails every year until 2018 and I would still say "Mmmm, I don't think so." Hopefully, we'll all recover from this. In the meantime, to all my friends, family, and fans of the Log, my best wishes for the most joyous Holiday Season along with a happy and healthy (and breezy) New Year. See you after Stardate 10800.0!